The Mushroom Cloud | American University Washington D.C.
A photo of the mushroom cloud resulting from the atomic bombing of Nagasaki, Japan, on August 9, 1945. Photo courtesy of Library of Congress. It's been 70 years since the U.S. dropped atomic bombs on Hiroshima and Nagasaki, yet the debate on whether it was justified is far from settled. 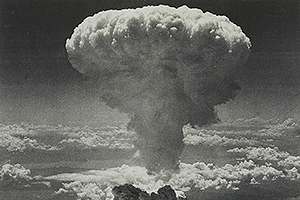 Peter Kuznick, an American University history professor, has closely studied the circumstances surrounding the American use of atomic weapons. And he's formed a highly critical view of President Harry Truman's decision—one he calls baffling and militarily unnecessary. Though numbers are inexact, Kuznick says that estimates in 1950 found 200,000 people dead in Hiroshima and roughly 140,000 killed in Nagasaki. In an interview timed with the August 6th Hiroshima anniversary, Kuznick expands on why he thinks the U.S. went nuclear. And he challenges basic assumptions many Americans hold about the end of World War II. Kuznick says a persistent myth about the bombings is that they thwarted a full-scale invasion of the Japanese mainland. The 'bomb instead of invade' narrative is powerful, presupposing that a lot more American and Japanese lives would have been lost if the U.S. hadn't swiftly ended the war that summer. "I think that is a theory that was concocted after the bombing in order to justify such a horrific act," Kuznick says. Truman's post-bomb statements were that "thousands of American lives were saved. Truman steadily increases that number over the years, as the criticism of the decision to drop the bomb mounts," he explains. A massive mainland invasion was unlikely, Kuznick says. "In August, we dropped the bomb, allegedly, to avoid an invasion that was not intended to begin until November?" he asks incredulously. "It was going to be a question of finding another way to force Japanese surrender or else using the bomb. No president would have allowed an invasion." Another question arises in this discussion: How close were the Japanese to surrendering? If Japanese leaders were actually ready to end the war, this undercuts the argument that atomic weapons were necessary. Below: A photo of the "Atomic Bomb Dome" in Hiroshima, Japan. Some historians have characterized Japanese leaders as recalcitrant, with surrender far from imminent. But Kuznick disputes this, based on what U.S. intelligence knew at the time. "The United States, you have to remember, broke the Japanese diplomatic codes. We were intercepting Japanese cables," he says. "And we know that as early as May , the Japanese had decided to try to enlist the Soviet Union to help the Japanese get better surrender terms." Cables and reports informed American policymakers about a key sticking point: Japanese leaders insisted on keeping their emperor, Hirohito, as opposed to "unconditional surrender" sought by the U.S. "Unconditional surrender, to the Japanese, meant that the emperor would be executed as a war criminal, which they couldn't abide. To the Japanese, the emperor was almost a god," Kuznick says. A number of American military and diplomatic officials believed that those surrender terms should be changed, Kuznick says. But adviser and Secretary of State James Byrnes had Truman's ear, telling the president that any change in those terms would be politically disastrous. The irony is that the Japanese were ultimately allowed to keep their emperor after the war concluded. American mistrust of the Soviet Union played a role in Hiroshima and Nagasaki, Kuznick says. At the July-August 1945 Potsdam Conference in Germany, Truman met with Soviet leader Joseph Stalin and British Prime Minister Winston Churchill to discuss postwar plans. With hopes for a quick end to the Pacific war, Truman secured Stalin's assurance that the Soviets would enter the war against Japan, too. Yet during the conference, Truman got another piece of news and a subsequent full report: American scientists had successfully tested the A-bomb in New Mexico. At this point, Kuznick says, Truman no longer wanted the Soviets' help. If the U.S. could unilaterally finish off Japan with the bomb, the thinking went, why give postwar concessions to the Soviets? Churchill observed Truman's suddenly confident demeanor at Potsdam, which Kuznick says is important to ascertaining the American president's mindset. "I couldn't understand it. When he got to the meeting after having read this report he was a changed man. He told the Russians just where they got on and off and generally bossed the whole meeting," Churchill noted, according to Secretary of War Henry Stimson's diary. Another aspect of this is usually known as "atomic diplomacy." In other words, the bomb was a warning shot to Stalin just before the onset of the Cold War. "It would send a message to the Soviet Union that if they mess with the United States and American interests, they were going to get the same treatment," Kuznick says. Citing evidence of atomic diplomacy, Kuznick points to statements made by Leslie Groves, director of the Manhattan Project. "There was never from about two weeks from the time I took charge of this [Manhattan] Project any illusion on my part that Russia was our enemy, and the Project was conducted on that basis," Groves would later say. Kuznick covers this subject extensively in The Untold History of the United States, a book he co-authored with filmmaker Oliver Stone. At AU, Kuznick is director of the Nuclear Studies Institute. Since its founding in 1995, he takes AU students to Japan every summer to meet with survivors and learn about the bombings. It's a history too often overlooked or purposely ignored, Kuznick believes. This is partly because World War II is thought of as "the Good War," defeating Nazi, fascist, and imperial powers. Kuznick agrees that World War II was a just fight, but he also urges students and citizens to examine the totality of the conflict. "I've done a number of sessions with World War II veterans. And by the time I start off the discussion, everybody in the room defends the bomb. An hour and a half later, almost nobody will defend the bomb," he says. "In some ways, what we're saying is that the American troops, actually, deserve the credit for defeating the Japanese. Not some bombs. That we had already won the war, and they should be credited." In commemoration of the Hiroshima and Nagasaki anniversaries, Kuznick teamed up with the American University Museum at the Katzen Arts Center to bring the Hiroshima-Nagasaki Atomic Bomb exhibition to campus. The exhibit includes 20 artifacts collected from the debris of the 1945 atomic bombings of Hiroshima and Nagasaki as well as 6 large folding screens that depict the horrors of the event. The 1995 Nobel Peace Prize nominees, Iri and Toshi Maruki, created a total of 15 screens over 32 years from 1950. This exhibition, made possible by the Hiroshima Peace Memorial Museum and the Nagaski Atomic Bomb Museum, is meant to deepen understanding of the damage wrought by nuclear weapons and inspire peace in the 21st century.